Dubai, UAE, August 29, 2018: Today, Lenovo released its latest generation of Android tablets, built for sharing and entertainment in the family: The Lenovo Tab E7, Lenovo Tab E8, Lenovo Tab E10, as well as new mainstream and premium tablets, the Lenovo Tab M10 and Lenovo Tab P10. As the newest follow-up to its popular mainstream Android tablets, Lenovo is now offering families with even more portable options: Android tablets that are powerfully built, thin, light and purpose-built to be used around the house. Superior performance for your money over the long run. 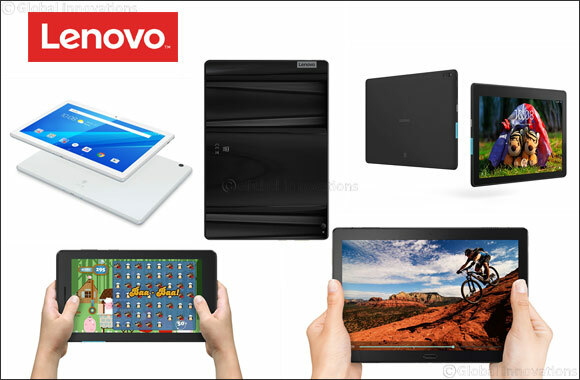 With Lenovo’s new versatile E series of tablets, families can now choose a tablet to meet nearly any budget and need. Finally, the Lenovo Tab E10 is built for families who need a complete audio-visual experience on the tablet for the home. This powerful and thin tablet packs two front speakers with Dolby Atmos and a 10-inch HD display, along with the speedy Qualcomm® Snapdragon™ 210 processor. The Lenovo Tab E8 and Lenovo Tab E10 both come with 5MP auto focus rear cameras and 2MP fixed focus front cameras. Cord-cutting households who use their tablets non-stop at home and on trips will want the optimal entertainment experience and sharing options, which is why we’ve rolled out the mainstream Lenovo Tab M10. It’s light and versatile - ideal for web-browsing at home or keeping the kids engaged at a restaurant, with powerful Qualcomm Snapdragon Octa-Core 1.8GHz processors, stunning 10.1-inch Full HD displays and Dolby Atmos support. With a thin and light profile (at 48 grams), the sleek Lenovo Tab M10 also has great multimedia features, including dual front speakers. Families with kids can also get the optional Kid’s Pack for a durable and enjoyable experience through a custom shock-resistant bumper and special kid’s mode that features up-to-date and curated children’s content. But households in which tablets see the heaviest multimedia use can opt for the ultra-premium Lenovo Tab P10. Lenovo’s flagship Android tablet redefines the family tablet with a head-turning dual-glass design, all-metal framing and narrow bezels in an ultra-slim and light profile (at 7mm thick and 440g), while its stunning Aurora Black or Sparkling White casing gives off a stunning aurora reflection design as you turn it. But it’s in the entertainment features where the Lenovo Tab P10 truly shines, with four (yes, four) speakers that will make the best use of Dolby Atmos. The Lenovo Tab P10 is equipped with an 8MP auto-focus rear camera and 5MP fixed focus front camera. A tablet this stunning and powerful will definitely see a lot of use, featuring an ultra-fast fingerprint sensor that takes full advantage of the built-in multi-user capabilities. Once a family member profile is created, simply tap your finger on the fingerprint sensor to log into your own personalized tablet experience, which houses your wallpapers, settings, apps, games and personal files, all kept separately from the experiences of your parents, siblings or kids in the home. Whether you’re looking for portability, shareability, kid-friendliness or performance, Lenovo’s got a tablet for you that will meet nearly any household budget.